Do You Need to Visit the Emergency Dentist in Orange Park, FL? Did you know that Dr. Nawrocki is your emergency dentist in Orange Park, FL? Unnecessary trips to the emergency room put a strain on everyone. But it can be difficult to know who to turn to when the unexpected happens to your teeth or gums. We’ve listed the most common emergencies treated by your dentist below. Call us as soon as possible when one happens to you or someone you love! They can happen at any time — and when you are faced with a dental emergency, there are two important things to remember. First, remain calm. Panicking will likely only worsen the situation. Second, contact your emergency dentist immediately. Quick attention can mean the difference in saving your tooth and not. At Dr. Nawrocki’s office, we frequently treat the following dental emergencies. Often the result of a sports injury or a Sunday afternoon bike ride gone awry, a knocked out or dislodged tooth is a scary thing. If the tooth is totally missing from the gum, do not wait to contact your dentist. Fast attention is crucial to its successful reattachment — teeth that have been outside of the gum for longer than two hours are unlikely to be reattached. Find the missing tooth and rinse away any debris. Do not touch the tooth’s root. Try to store the tooth in its empty socket, in the cheek, or in a cup of milk or water if the former are not possible. Call your dentist as soon as the situation is stabilized. For a dislodged tooth, try to gently move it back into place. Do not force the tooth. Contact your dentist immediately. Another common sports injury is the broken or fractured tooth. Collect and store the larger pieces for possible reattachment. Ease pain until you can reach our office by taking an over-the-counter pain medication, and reduce swelling by applying an ice pack to the affected cheek in 10 minute intervals. Do not ignore a toothache. Teeth don’t heal on their own, and an ache indicates infection or decay that requires a dentist’s intervention. Serious infection may lead to an abscess, which can quickly spread to other parts of the body. Contact your dentist at the first sign of an aching tooth. Sometimes, emergency root canal therapy is the only way to save the tooth from extraction. Your dentist will evaluate the extent of the decay and infection and help you understand what is best for you. While there’s no way to guarantee you’ll never experience a dental injury requiring urgent attention, there are some steps you can take to prevent them from happening to you. If you play contact sports or grind your teeth at night, protect your teeth with a custom-fit mouth guard. Avoid using your teeth as tools — always find the scissors when opening packages. Maintain excellent dental hygiene to prevent tooth decay and infection. But remember that when something unexpected does pop up, your dentist in Orange Park, FL is prepared! Contact us immediately following a dental emergency. 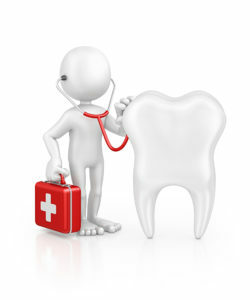 Comments Off on Do You Need to Visit the Emergency Dentist in Orange Park, FL?